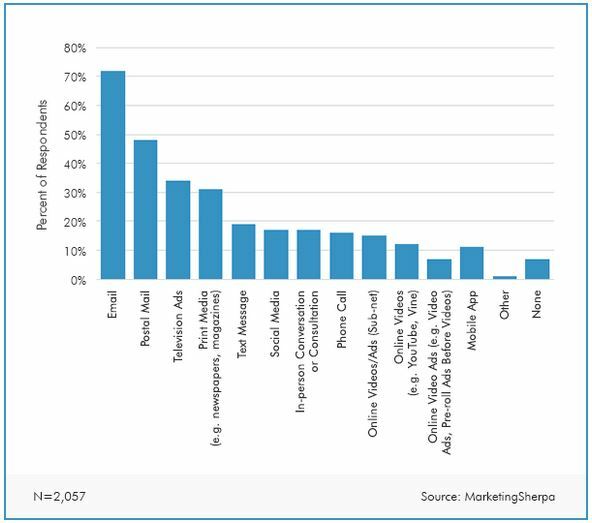 1 Is Email Marketing Dead? 6 Back To Timed Email Deliverability…. Hopefully all my readers are convinced of the importance of building a list of prospects and customers (see Wikipedia on email marketing for definition) but what some Internet Marketers fail to appreciate is the importance of email deliverability. I will take as understood the concept of permission-based email marketing, see the definition above if you’re in any doubt. Today I want to just concentrate on the importance of ensuring that your email marketing campaign stands the best possible chance of being read. First off, let’s just knock on the head any myth that email marketing may be dead, and I do this by reference to two excellent articles on the subject. I’m indebted to the sources for these two tables. 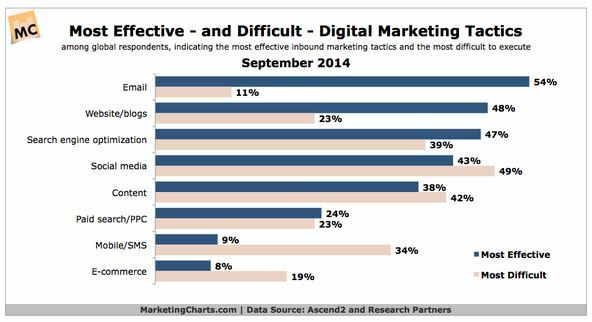 Firstly MarketingCharts.com (September 2014) finds email marketing the most effective and least difficult digital marketing tactic – email marketers could have hoped for one “best” measure, but being best at both is a real bonus. In case you’re in any doubt about this, just have a think about your own preferences. Suppose you’ve either bought, or are thinking of buying, a product XYZ and you’ve expressed an interest to learn more. Would you prefer the company to email you about it, so you can read it at a time convenient to yourself, or would you prefer some other way? Here I consider the alternatives that most irritate me. Always assuming that the advertiser would like their message to be welcomed by the consumer. I HATE being contacted by phone by even the most loved product provider (they just seem to pick the most inconvenient time to ring me). A marketing or surveying phone call is always an unwelcome intrusion. TV ads I just skip past when recorded (95% of my viewing), or on live TV I use commercial breaks to make a cuppa, fetch something, or fall asleep in them – oops. Yes, I can ignore emails too – but what a cost difference for the advertiser to have their message ignored. Mailshots I perceive as expensive and adding to the cost I pay for a product. Texts I really resent. I consider my mobile as “personal to me”, not an advertising medium. However I’m very happy to read and (sometime ignore) attractively presented emails. An email puts the choice to interact back with the consumer. Is it just me being odd, or do you feel the same? All the above is fine and dandy so long as your email provider’s emails are actually arriving in the consumer’s in-box, and this is one of the most important reasons for using a reputable email service provider. I was happily using a well-known email provider company, liked their facilities and their support, but I noticed that my “open rate” was pretty abysmal. Then one of my readers proved conclusively to me that my emails – even the company’s own “permission to contact” email had gone straight to his junk folder. It was nothing to do with the wording of the emails. They passed a spam checker with no problems. Further research on my own part showed me that even my work-related emails to regular customers using this company’s servers were being classed as spam and not received. So when choosing an email marketing platform I submit that one of the most important factors to consider is their email deliverability, and poor results from my previous supplier on that aspect of the service decided me to move. Moving email service providers is no mean feat, and open to loss of subscribers if they have to opt-in again, but having failed to resolve the problem with the ESP the only way was to move on. Luckily (for me) Aweber and GetResponse have relaxed their approach to importing lists from other email providers. This is good, so long as unscrupulous marketers don’t abuse the facility. To choose my new auto-responder I looked at 3 well-known and reputable email service providers (ESPs): MailChimp, Aweber and GetResponse. All 3 offer great facilities, and I don’t propose to compare feature by feature, as there are many reviews that will look at them on that basis. Instead, I am concentrating on the reason I decided to move from the other (unnamed in here) ESP, which is because I wanted to be sure of good email deliverability. Most of us are aware of the need to avoid “spam triggers” in our emails… superlatives, all capitals, lots of exclamation marks, certain words, and references to large amounts of money. But one aspect of email deliverability that’s not often spoken about is that even if your email arrives into your subscriber’s inbox, how likely they are to read it may depend on how deeply buried it is within other emails received. When I send emails I want to be sure that they’ll arrive at the best possible time for them to be read. The features offered to keep MailChimp’s deliverability high, including “delivery by time zone”, are impressive and with a free “Entrepreneur Plan” that will let you send “12,000 emails to 2,000 subscribers for free, no contracts, and no credit card required” this looks a very tempting contender. But WAIT…. 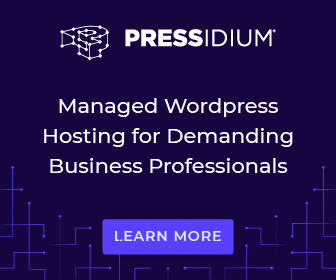 check out this list of features that are only available to paid subscribers, in particular Automation and Delivery by Time-zone. The feature missing from the free account that was a complete “No-no” for me even taking a trial was the fact that “Automation” is only available to paid subscribers. My main reason for wanting an auto-responder is to deliver a set of pre-defined email messages to prospects wanting more information on my products i.e. to deliver my free “lead magnet” and marketing messages in addition to newsletters / broadcasts. Personally, the only way I could consider MailChimp as my ESP would be as a paid subscriber – which, obviously, is what they want. The free option is their “lead magnet”. That said they offer a valuable free service to people who don’t need automation and delivery by time zone – maybe a small local business just wanting to send out a newsletter to all customers in the same geographical area. As an aside, it’s said that there’s no such thing as a free lunch and that may be the case with auto-responders too. Here’s another cautionary tale…. One “free auto-responder” I tried several years ago gave a free service, but at the “price” of including adverts targeted in the same niche that I was emailing. 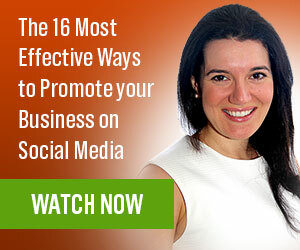 It wasn’t obvious to prospects that these weren’t my promotions, so it was quite easy for me to lose subscribers even on the “Permission based” confirmation page – before they actually made it to my list. OUCH! I’m not a great fan of “free” business services anyway – especially email service providers. Your mailing list can be your company’s most valuable asset and I firmly believe you should value it enough to pay someone to look after it. Back To Timed Email Deliverability…. You will want to cater for the specific purpose of YOUR email which may be completely different from other customers. So, for example, you would wish to target a business-related email in business hours, but a leisure based email in the evening. And ideally you want this to be the case whatever the time zone of your subscriber. MailChimp offers paid subscribers “Send Time Optimization” which lets you optimize your email send time, weighting it towards the “most engaged” readers on your list. They can work towards this even if your list is new by checking your subscribers that may be on their other customers’ mailing lists. Aweber offers an option to send follow-up messages based on the subscribers’ local time starting with the second follow up message. The option doesn’t exist for the first follow up message, because it always goes out automatically as soon as someone subscribes to your list. The option isn’t available for broadcast messages. 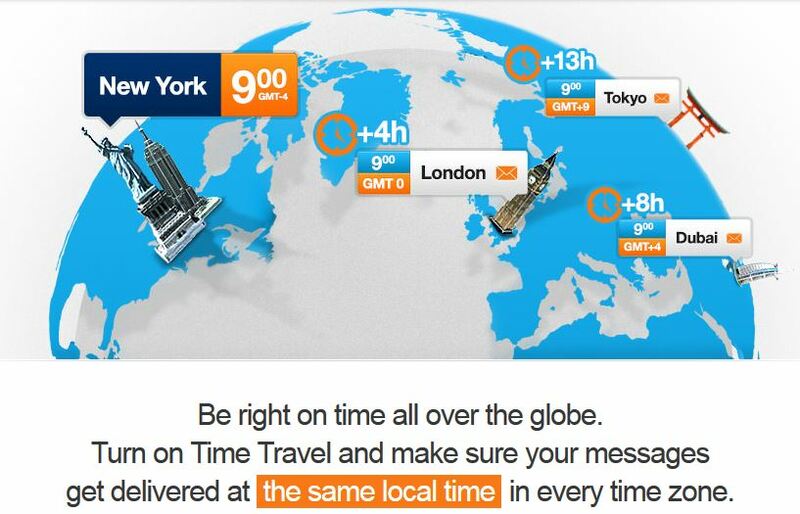 Time Travel from GetResponse means that you can target your mailings to arrive in the inbox of your recipients, according to their time zone, when they’re most likely to be browsing through it. I have been a paid subscriber to both Aweber and GetResponse, at the same time, and as I did my Aweber broadcasts I was always conscious that I couldn’t time-target my overseas broadcasts as accurately as I was able to do with GetResponse. Although I have no reason to doubt the quality of MailChimp’s support desk I haven’t been able to test it, as it is not available to free subscribers. While I understand their wish not to work unpaid this is a shame, as “in the early stages” is probably when the most support and help is needed. I have tested the support from both Aweber and GetResponse and found them excellent. It’s particularly appealing that they offer a Live Chat facility, which can resolve some questions very speedily. The support desk at GetResponse is worthy of very special mention, because they solved a tricky problem for me as I was integrating my 3rd party lead page generator with GetResponse. One landing page wasn’t working quite right, so I first contacted the support desk at the 3rd party developer, but they didn’t find the problem. Imagine my surprise when I contacted the GetResponse help desk and they pointed out my mistake when setting up the landing page – i.e. they diagnosed a problem in setting up a 3rd-party software tool that the developer had missed! How cool is that? 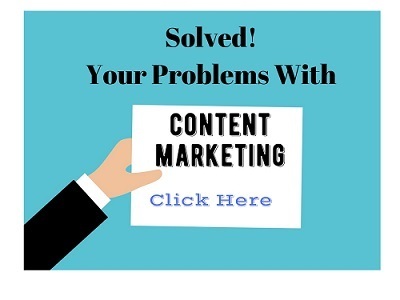 As an aside, if you don’t have a stand-alone lead pages generator like I have, GetResponse includes over 100 responsive (mobile ready) pages that you can customize and have up and running in a few minutes, providing a very professional look to encourage visitors to become subscribers. Your basic plan includes 1 published landing page, up to 1000 visitors/month. Choose from pages such as these below. Quick aside: if you have been referred to this page by Paul Lester, the “Elite” service he is providing probably replaces the need for the above landing pages add-on, and Paul’s service costs less. Finally, given that these 3 auto-responders all offer high quality services, a brief look at cost. 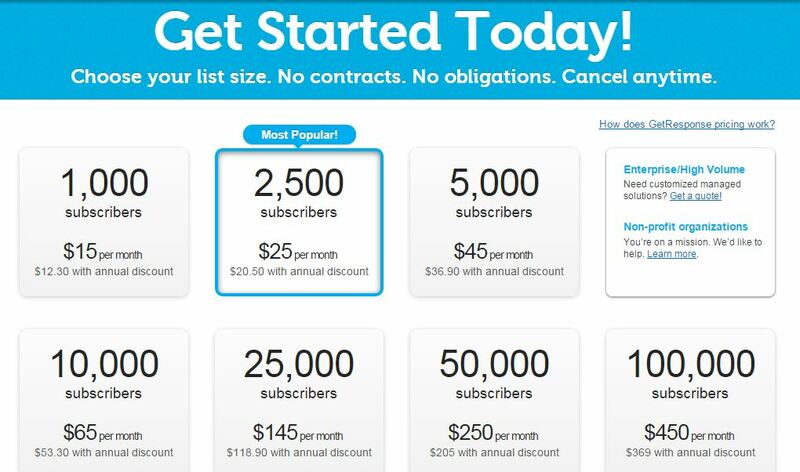 All prices are taken from the suppliers’ websites at the time of writing, August 2015.
plus the “subscriber cost”, so the minimum cost after the free trial is $19 per month for 500 subscribers. For a free trial of Aweber, click here. The MailChimp free option is very tempting, but see my comments above about the facilities excluded from the free service. 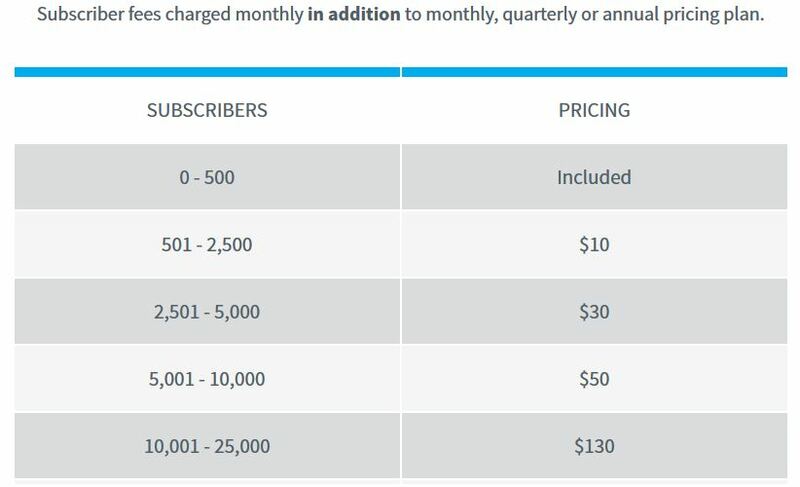 Although MailChimp is slightly cheaper to get started as a paid subscriber, it “draws” with GetResponse at the 1,000 level, and at the $25 level, you will get more subscribers for your $25 with GetResponse than with MailChimp. For a free trial of MailChimp, click here. Note the annual discounts which help reduce the pricing even further – but a slight warning, EU customers will have to pay VAT on top of the quoted prices. For a free trial of GetResponse, click here. As mentioned previously, I paid for both Aweber and GetResponse at the same time, because I had a “list” in one niche with GetResponse, and another list in a completely different niche with Aweber. Paying for two separate services removed the risk of sending the wrong email to the wrong niche! I did that once, by mistake, and it generated many complaints. When I stopped trading in the niche I had been using GetResponse for I stopped using it – and regretted it. I wish I had stayed with them, BUT now I’m going to correct that and return to the GetResponse fold. Taking the free trial with GetResponse, and going through the free training course they offer, has shown me that first time round I missed a LOT of valuable features. Or perhaps they were “beyond me at the time” – or have only recently been added. So while I have no complaints about the quality of service from Aweber, I have decided, following my free trial with GetResponse to move my lists to GetResponse, and that’s largely because of the superb email deliverability options they provide. 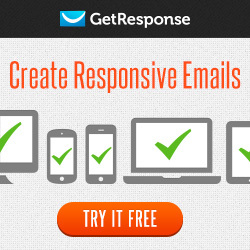 Click here, or the banner above to take your free trial of GetResponse. Are you happy with the open rates of your emails? If not, have you considered that your provider’s email deliverability could be a problem? I must say, Joy, you really give us a thorough review here, very much appreciated! I am preparing my product and one has to seriously think through the entire process based upon both your current and future needs. They each seem to provide great features at reasonable costs so it really comes down to the list owner knowing what their goals and needs are. To me it would seem to be a gamble if you decide to choose to switch to a different provider down the road. I think it’s worth the time and research to make sure you are with the service you want to stay with long-term up front. Very valuable information Joy, thank you! The big mistake I made when starting out was lack of research / knowledge. If I had known then what I know now…. but that’s part of life really isn’t it. We’re always learning. I made some expensive mistakes in both time and money by having to switch auto-responders part way through. But I’m really pleased to have seen the light and come back to GetResponse. I won’t be switching again! I chose Get Response a while ago and don’t regret it. My only beef with most autoresponders is not being able to easily create long narrow subscription forms, suitable for the end of posts rather than just those best for sidebars. So I was delighted to see Get Response is now beta testing a new form creation wizard which offers much more flexibility in the form design and templates. Glad to hear you’re a happy GetResponse customer too. I think their new form creation wizard will help a lot of people. Creating a sign-up form sounds so easy now but I remember when I started out online it seemed one of the most difficult jobs in the world so anything that helps with this is great. This is an excellent post Joy! Your research is very thorough and extremely practical. 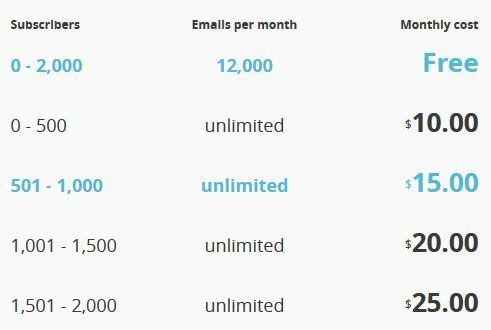 these three excellent paid email service providers. beginning, you’ve made the case for each. Your charts were extremely helpful as well. Thanks so much for sharing your totally understandable expertise! Because I always learn things of value, whenever I read your posts! Glad you found the post helpful and interesting. It IS hard to choose between the 3 auto-responders, but GetResponse is my clear favorite for the reasons I mentioned. I’ve sort of grown into it, by discarding other Email Service Providers. Hopefully more savvy (and less stubborn) people than I will choose the right auto-responder first time! Great breakdown of email providers! I actually use MailChimp and I haven’t had any issues with it. I will take a look over once I hit some of the subscriber numbers, then perhaps I need to move to another provider. Many people use MailChimp quite happily and they provide a great service. I’m not aware of any problems with it, but I didn’t take the free trial because it didn’t allow me to send follow-up messages, which was the most important function of an auto-responder to me. If you do decide to move, you can take free trials of the other providers before making any decision. 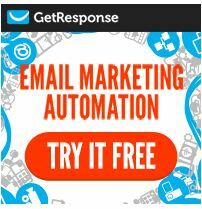 Useful, and well presented, tutorial about the big 3 autoresponders/email service providers. I’d assumed Aweber had a better deliverability rate than Get Response because of time in business and size of operation. Your choice, then, was an eye-opener for me. It’s an easy assumption to have made, but I think that the Time Travel option in GetResponse gives it the edge. By the way, I installed that plugin you suggested – let’s see how it goes. Thanks for the suggestion. Lots of excellent information in your post, which is more like a really great tutorial, Joy. I enjoyed how you used actual statistics to dispel the myth that email marketing is dead, then you went of to share your personal experience before exploring the options. Great research. Thanks! Hi Yvonne, I’m glad you liked my approach. I have to confess I was doing that research to convince myself about the effectiveness of email marketing, as I’d rather let it slide over the recent months which have been beset with family crises. Seeing those stats have encouraged me to redouble my efforts and focus on ways to replicate the success of good email marketers. I feel that GetResponse has the facilities I need to improve my own response rates. I have been using Get Response for a couple of years now and they do offer a really good service. Ive often wondered about trying AWeber as Ive heard good things about them as well. Glad you’re a happy GetResponse user for so long. I’m still getting to grips with everything they offer, but it’s really impressing me. Aweber is good too and I couldn’t criticise them in any way, it’s just that I thought GetResponse had the edge over Aweber so I’m sticking with GetResponse now. Thank you for this detailed review, I am personally with aweber and been with them for nearly a year, so far I am okay with them. But when reading a your review and some others that have favoured Get Response, also it can be easily integrated with Jvzoo, I wonder if I made the right choice. I’m glad you found it interesting to take a look at GetResponse. I have nothing against Aweber, and used them happily for quite some time before deciding that GetResponse better suited my needs and budget. For anyone wanting to use JVZoo, GetResponse has a clear advantage. This is a well written review without bias of any form. But your post is an eye opener as to where to go when I am about to build another mailing list. It was important to me to give an unbiased review, because the three autoresponder services I have looked at are all excellent in their own way and have many happy users. That said, I was so impressed with GetResponse that I decided to switch my own lists. Duane has also made a couple of excellent points that I’d missed too, so do remember GetResponse when you build your next list. I recently embarked on the same quest to find an Autoresponder Service for my business. Since part of my business is affiliate marketing, I stayed away from MailChimp, whose T&C’s are a little ‘grey’ when it comes to using MailChimp for Affiliate related mails. In the end, I also decided to go with GetResponse mainly because of the one fact you haven’t mentioned: GetResponse Integrates seamlessly with JVZOO and you can sync JVZOO buyers with your list(s). Have you tested the new GetResponse forms yet? Thanks – you made a fantastic point about GetResponse integrating with JVZoo. I was aware of this, but so pleased with so many of the other features I noticed for the first time that I forgot all about. Thanks for the reminder, also for the point about MailChimp and affiliate related emails. I haven’t tested the new GetResponse forms yet as I’ve been busy moving my lists from Aweber to GetResponse. Thanks for your visit, and for adding some excellent points to my review. Appreciate that. Thanks for that, it isn’t one I know but if it’s performing and linking in well for you, that’s great. This was an interesting and well researched post. I currently use Aweber, and I am happy with the service they provide. Thank you for sharing. 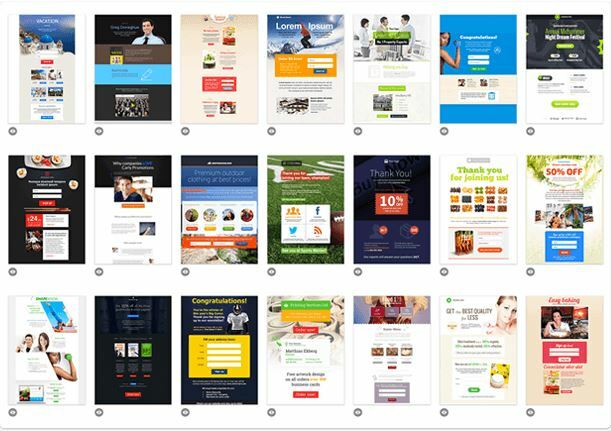 There are indeed so many different email marketing service providers out there today while some of them are really good, the rest is just nonsense especially the ones that claims to be free. I’ve also experimented with so many free ones out there and just like your own experience, they always fill my emails with ads. Finally, I’m also a big fan of Getresponse and I’m happy you also found them very useful. I’m glad you also share my suspicions about free autoresponders. We all know that there’s no such thing as a free lunch, so why would be imagine the rule isn’t the same for auto-responders. Some people seem to be happy with them, but I like the security of knowing I have support when I need it, and that that the ESPs aren’t using my contacts for their own purposes. I’m glad you’re pleased with GetResponse too. I’m very glad to have changed back to their service. Thanks Joy, lots of great info here. I have used GetResponse and Aweber in the past, but due to the fact that I didn’t really focus on email marketing they were not cost effective so had to let them go. However, now I have a great business opportunity to promote (as you know – wink, wink) I need to set one up again, so your reviews are a great help in making a decision between the two big boys. Glad you found it a helpful post, Barry. We’re both on the same page with the great business opportunity:-) Either of the two big boys will integrate with the promotion initiative that Paul’s so kindly organizing for our team.